2011 Crotona Midnight Run: Results Are In! 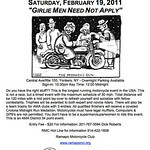 The Ramapo Motorcycle Club posted the results of the 2011 Crotona Midnight Run. Many congrats to the winners. You did an awesome job! A perfect score? WOW! I had no intention of winning anything so this is a big surprise for me. I thought I screwed up pretty badly but as it turns out I really didn’t do too bad in the points department. Congrats to all participants. If you came out on that cold, dark February night – you’re a winner in my book. ..now? Where will I put my trophy…? Thanks again for a fun night, Ramapo MC! HUMONGOUS HEAPS O’ CONGRATULATIONS! (I’m doing the “I’m not worthy” bow). Love your new theme – had to switch over to FireFox after I saw someone mention it. Congratulations!! It’s an accomplishment to receive a finish medal in this event. A trophy finish is exciting and something to be proud of. Thanks so much Doug, Wendy, GL, Pam & Keith! You had no intention of winning?! Come on Fuzz, it’s me 🙂 and I was there… I could hear your competitive voice come out in the parking lot at the start! As for me… I think I kept pretty close to my time, even with getting pulled over, but I think I may have missed a check point. Again. I think in the future the RMC needs to use neon paint on the road cause when it’s pitch black out there, it’s tough to notice the random person standing on the side of the road! My odometer was so far off. When YOU made the left on red, you had 8.x miles on your odo and I had nearly 10.x. I also forgot to set my clock correctly. When I tell you i’m surprised I didn’t lose WAAAY more points, i mean it. Having stopped near the flagpole, u-turned and all that – i’m really shocked. How many checkpoints do you remember? I can only remember 3 off hand. Is that right? I seem to remember you being close by when we hit them. There was the guy in the point hat on an uphill at a traffic light where we made a left – i seem to remember seeing you in my mirror for that one. There was Ben & his wife, you came up behind me when I was pulled over and then the final check. Was there one more? I’d be willing to bet you did much better in points than I did. You coulda been a contenda! That is SOOOOO cool. Congratulations! Nice! Congrats on your Victory. You’re so cute, Ralph. 😆 Thank you!